Daniel’s last post of my belly-shot, on our way to the hospital. I was 23 when I married, got pregnant at 24 and became a mom at 25. My real labor was just for a few hours but it was really very painful. May 3 was my due date, Nathan didn’t decide to come out that day yet, we went to my OBGyn and found out that I was already 2cm dilated. Nathan passed the biophysical test with flying colors so we had to go back home. Doc said it was still too early to be admitted. That was a Saturday. Sunday, May 4th, we went to church to attend our regular worship service and head home to do some walking exercise with my hubby, Dane, my sister – Beverly, and my friend Melody. We decided to go visit the La Mesa Water Dam since it was just near our place which was really a perfect place to do some walking. What’s more fun is the hundred steps stairway (I guess) which was perfect for me. We went up, took a rest then went down. That was so tiring specially for me who 1 day overdue but I was feeling fulfilled that I was still able to do it. Before we went to La Mesa, I went to the bathroom to pee and to my surprise, there’s a lot of really thick white blood on my undies, Nathan was my first baby so I didn’t really know what exactly to expect. Thankfully, my cousin, who is a certified midwife is always available online to help me. I was told that it was a mucus plug which means I was getting nearer and nearer my labor. 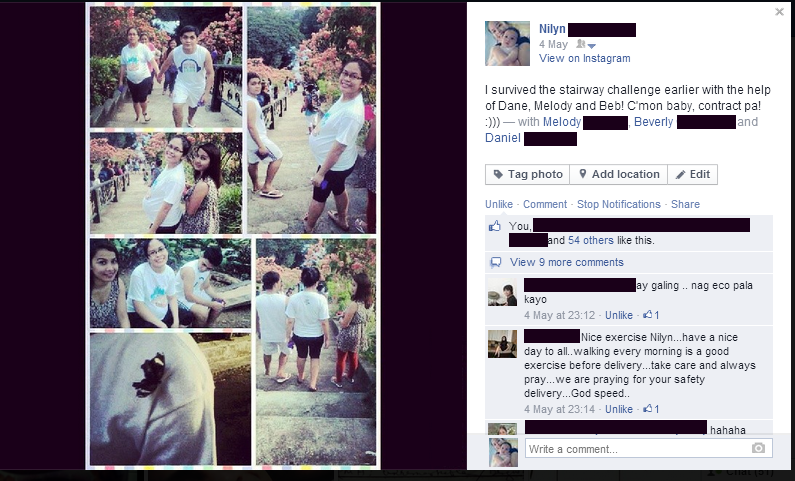 We went to La Mesa Dam and I climbed up the (hundred-steps, I guess) stairway. It was so tiring but I was able to manage going up and down. Perfect to help Nathan go down. We head home, had dinner, my sister and I talked to our family who were far away in our hometown and decided that we join them in their devotion. My father prayed for me and for my upcoming delivery. It was so refreshing to know someone prays for you. My sister and I chatted for quite a while and I slept around 12 midnight. Monday, when I woke up, I felt so wet like I was having my first day of menstruation so I headed to the bathroom to check. There was a strange gush of blood and I panicked for a short while. My cousin was still available online to advise me that it was a mucus plug. We decided to go to the doctor to make sure everything is fine. I was so after of my water breaking without me knowing it, I was afraid Nathan would get an infection. I asked if I could still take a bath and was told yes. I was advised to eat and time my contractions. If the contractions are regular, meaning, the length of time of contractions and the interval of it are the same, it means I am in true labor. Also read about my hospital delivery experience. I experience pre-term labor contractions with my 2nd child and it was really hard. I was trying for a VBAC but end up to CS again. I have high pain tolerance. I didn't know i was already in labor for a week with my second child. I was already losing amniotic fluid apparently and had no idea. My OB told me i was lucky it did not pop as it was dangerous for both me and my child! I had to go under the knife because of that! But i was really blessed i had that scheduled ultrasound. Korek Mommy Aci! I really hope so too! haha. That must be really painful too. How many cm dilated were you before your doc decide for CS? I had the same situation with a friend. Sabi din sa kanya muntik na daw maubos amniotic fluid nya and baby's heart beat was also getting low so she had emergency CS. Wow, 24 hrs is too long! Thank God for the strength you had at that time. You're welcome! Thanks for sharing your story too! Haha, nakakatawa nga, minsan mas nagpapanic pa ang asawa ng mga buntis at chill lang ang asawa nila. Ang haba din ng labor mo. I'm glad kahit emergency CS, ay OK kayo pareho ni baby mo.